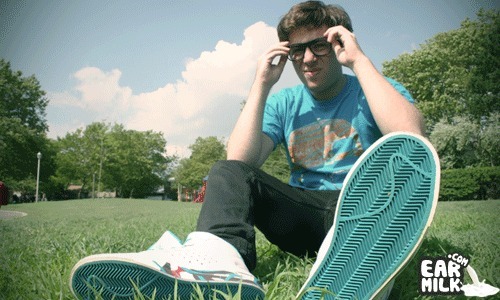 Hoodie Allen has released his first ever music video for his track "You Are Not A Robot" from his Pep Rally mixtape. Looks like Hoodie is on the run from a group of kid robots! Looks like they had a lot of fun shooting this video. Don't sleep on Hoodie because he's definitely a breath of fresh air and he continues to make music that is upbeat and inspiring. Check out the video and the mixtape below. So, watch the video above first then check out this link to see the "Non-cute" version. This is where i took Hoodie Allen "You Are Not A Robot" and sync it up with a song from the movie The Omen. Then the kids in the video become creepy! Watch it HERE. Mute the video on the left. Is this guy gay? Cause he runs like one.